Nearly 40,000 Verizon Communications workers walked off the job Wednesday and were joined by U.S. Democratic presidential candidate Bernie Sanders as they protested a lack of progress in contracts talks more than eight months after their agreements with the company expired. 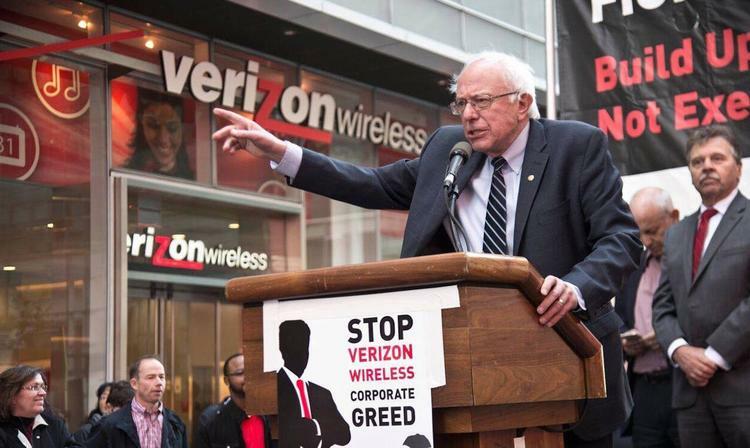 Sanders joined the protests outside Verizon offices in New York City and said the workers were displaying courage by standing up to the telecommunications giant. The strike was called by the Communications Workers of America or CWA and the International Brotherhood of Electrical Workers that jointly represent employees in areas such as customer services and network technicians in Verizon’s traditional wireline phone operations. Verizon and the unions have been talking since last June over the company’s plans to cut health care and pension-related benefits over a three-year period. The workers have been without a contract since its agreement expired in August. Issues include health care, offshoring call center jobs, work rules and pensions. The talks have now reached an impasse as the company plans to go ahead with the new cuts. The strike could affect services in Verizon’s Fios Internet, telephone and TV businesses across several U.S. East Coast states, including New York, Massachusetts and Virginia. Verizon said it was “regrettable” to see that unions have called for the strike and dismissed that its operations will be disrupted because they have trained non-employees over the past year to do the strikers’ job.